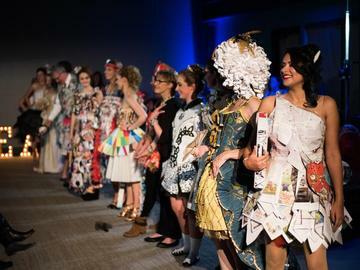 READ(y) to Wear is our annual paper inspired benefit fashion show. This exciting event brings together lovers of reading, fashion and fun to see the paper creations of participating teams. The night will be full of energy, DJ, cash bar, snacks, wine pull, a craft table supplied by Mohawk and sponsored by Suttle-Straus, and, of course, the runway. Connoisseurs of style and literature from a range of Madison’s professions and pursuits will form our panel of six judges. Teams compete for "best" in show. Join us for all the fun to raise funds and awareness for Madison Reading Project. Here are a few pictures from our 2017 and 2018 shows. Pictures courtesy of Jeremy Potter and Joel Ondercin (http://www.jondercin.com).